It's been confirmed that former Cardiff City manager Eddie May has died. The man who led City to the old 4th Division title in 1993 passed away in his sleep today. 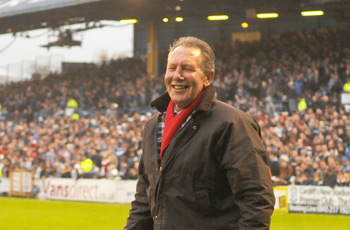 Eddie May played for Southend with over 100 appearances, became a legend at Wrexham with over 300 appearances before playing 90 games for Swansea. He managed Cardiff between 1991 and 1994. In 1993 he led City to promotion and won the Welsh Cup. In 1994 his side beat Man City through Nathan Blake's sublime goal. May was well respected by all City fans and has always kept links with the City including running a local hotel and in 2009 managing one of the sides in the game that opened the new Cardiff City Stadium.